Beijing is the capital of China, and it is a fascinating city with a rich history, unique culture, and delicious restaurant scene. There are many affordable hostels and hotels in the city. Many are located around the Forbidden City and public transportation is relatively easy and straightforward. Many hostels make use of traditional architectural elements and have a courtyard in the middle where guests can hang out. It's relatively easy to find affordable accommodation in Beijing, but reservations are recommended simply because Beijing is so large. Prices are usually quite reasonable. 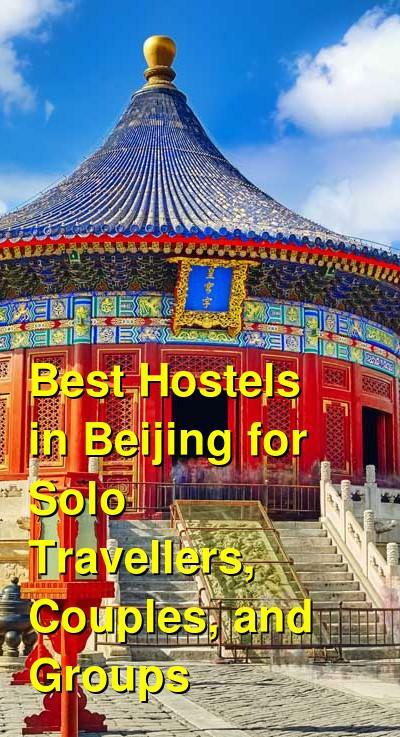 How much do hostels in Beijing cost? Sitting On The City Wall Courtyard House is a top rated hostel in not just Beijing, but all of Asia. 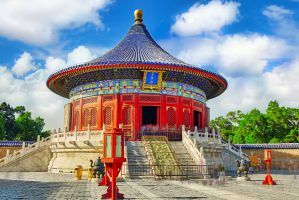 It's located next to Jingshan Park and the Forbidden City and is surrounded by traditional Chinese hutongs, where you can appreciate an authentic neighborhood and experience. The hostel also offers its own traditional setting, with a central courtyard and traditional decor. The hostel is clean and comfortable and the staff are really wonderful. Their English is good and they know the area well. They can help you with all kinds of information from transportation questions to booking tours or activities in the area. The hostel is also affordable with many great amenities including free wi-fi, a book exchange, and a nice common area. The hostel has both twins and doubles available as well as eight bed dorms. Every room has its own attached private bathroom. A good hostel for solo travellers, couples, small groups, and female travellers. 365 Inn is located in a 150 year old building with a lot of history and character. It's in a great location in the heart of the city where you can access public transportation or walk to any number of places. There are restaurants, shopping, and nightlife areas all just a short walk away. The hostel can also help arrange day trips to the Great Wall of China. It's a great way to see the Wall in one day, without the hassle and expense of navigating transportation on your own. This hostel lets you choose between private rooms and dorms. Private rooms are twins, doubles, or three bed rooms. Twin rooms have either shared or private bathroom options available. Dorms are four bed, six bed, or ten bed rooms. Female only and co-ed rooms are available. Beijing Downtown Backpackers is another popular hostel with young travelers in Beijing. The hostel is clean and comfortable and it is a fun place to stay where you can meet other travelers. The staff are helpful, and like many hostels in the city, they can help arrange tours and activities for you. Tours available include Great Wall tours and Hutong Bike Tours. There are also tickets to acrobatics shows, kung fu shows, and opera shows. If you need help planning the rest of your trip, they can help you make transportation reservations as well. The hostel has a shared kitchen available to guests, which is rare to find in hostels in China. It's nice to be able to buy some fresh produce and prepare your own meals. Beijing Downtown Backpackers has a wide selection of private rooms and dorms to choose from. Private rooms include a variety of twin, double, three bed, and four bed rooms. Dorms are three bed, four bed, six bed, or eight bed rooms. A good hostel for solo travellers, couples, families, and groups. Red Lantern House is another top rated hostel in Beijing. It's located in the heart of downtown Beijing in a charming hutong area where you'll be surrounded by a traditional neighborhood. It was the original courtyard style hostel, which has since been copied by many hostels in the area. It is set back in a quiet location but is still close to many restaurants, shops, sights and attractions. If you want to have an authentic experience with traditional Chinese architecture and design, then this is a great place to stay. The hostel continues to expand and has opened two more locations in the surrounding neighborhood. These new buildings expand the range of options available, so whether you're traveling with a group, as a family, or all by yourself, you're sure to find a room that meets your needs. The hostel has single, twin, double, triple, and quadruple private rooms available. Dorms sleep either four or twelve people.